The good thing about a potential pandemic is that everyone talks about it and wants to read about it. And the great thing about the internet is that it gives everyone a platform, regardless of whether they have anything of value to say. And the amazing thing about the traditional media is that they seem to operate on the same basis: people want to know about swine flu, they want disaster, they need tragedy, they want to feed you not only the suffering of others, but the suffering you too might experience. Facts don’t need to get in the way of that. So, without even the slightest hint of filtering, of providing analysis, commentary or balance – things you might expect from journalists – the media give us their take on swine flu. I want to highlight two in particular that I spotted and Tweeted about (here and here). The first is from the local Guardian – Clapham patient test for Mexican swine flu . If you don’t want to follow the link to read it (I wouldn’t recommend it) I will summarise it for you: woman tested for swine flu, probably doesn’t have it. She’s not been to Mexico, there are no cases in the area, just flu-like symptoms. I could go to my GP and get tested for bubonic plague. Chances are that I don’t have it. Not really sure it’s a great news story and while you and I might know both the flu and the plague stories are pointless, the really important bit is the headline. It’s a local paper, there’s a big national story that everyone wants to read about and they can give it a local angle: the headline is local paper gold. The second really annoyed me and was in thelondonpaper yesterday – 4,000 at risk of dying in Croydon if swine flu pandemic strikes. What? 4,000. My God. But there’s more, if you read on you are told you can “find out how your borough would fare in the event of a swine flu outbreak”. 3,517 people would die in Wandsworth. No, not 3,500… it’s much much worse than that… 3,517. A horrifyingly accurate statistic. Some places would fare better. The City, we are told, would suffer few casualties. Basically it assumes a uniform infection and fatality rate. If you assume the same proportion of people die in each borough then of course more would die in Croydon (population 338,825) than the City of London (population 7,985). It’s fairly basic maths. But the journalist obviously didn’t do too well in their maths GCSE because they claim “Croydon residents are at a higher risk of dying from swine flu than any other London borough.” No. Just no. If you assume a uniform distribution across the capital, as the tables and the paper do, everyone is at equal risk. thelondonpaper even acknowledges the tables were produced before swine flu was even heard of. So it’s all pointless conjecture anyway, we don’t know what the likely infection rate or fatality rate is. They are just numbers used for exercises, not numbers produced as predictions for swine flu. They may as well have plucked the numbers out of thin air, because they would have had as much relevance to a potential swine flu pandemic as the figures they have used. In fact, so far in the UK the fatality rate is 0, which would mean no-one will die. 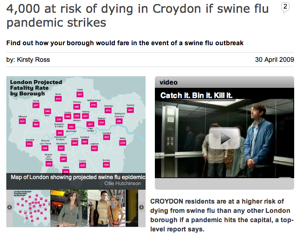 The headline should be “Based on available evidence no-one in Croydon will die from swine flu”. But that doesn’t grab you, does it. Ironically, using the media to disseminate information is often a key part of emergency planning, but when you get such shoddy sensationalist journalism as thelondonpaper yesterday you have to worry how well they will perform the vital role of informing the public. While there are less than 70 reported deaths from swine flu in the world (or actually consequences of… ), remember that there are at least 300,000 deaths in the world each year resulting from common influenza… about 6000 being in the UK.